In default Opencart, if the admin wishes to edit any order then it is a stepwise procedure. Means the admin cannot edit a particular section directly by navigating to that section. The admin first has to visit the sections defined prior to that section. This infuses a lot of time. But using Opencart Quick Order Edit module, the admin can edit the order from a single page. The quick order edit page display all the sections of order like customer details, products, payment details, shipping details, and order total within a single page. This allows admin to edit any section of the order without navigating to the steps which are prior to a particular section. The admin can enable or disable the module as per the requirement. The Quick Order Edit page displays all the sections of the order within the single page. Each section can be saved individually instead of saving the complete whole order. The admin can randomly edit any section of the order without following the step-wise procedure. The admin can easily edit a particular section of any order. Can easily edit any existing order from orders page. Can quickly edit order from order view page. Installation of the module is easy. Under the module zip, there are 3 folders image, catalog, and admin, you just need to upload these folders to the root directory of the website. 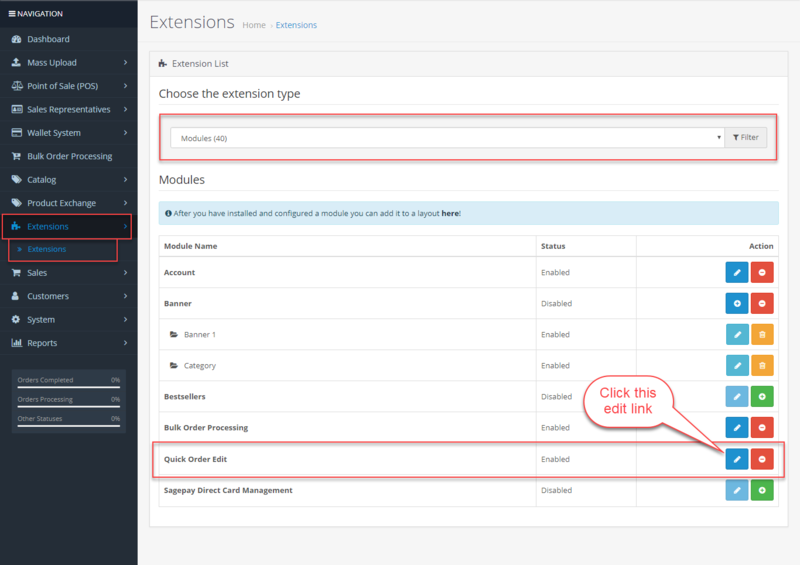 Now log in to admin backend and navigate through Extensions -> Extension Installer. Click the Upload button and browse the Zip file, this file is in the ocmod folder. Please select the correct ocmod folder. According to your Opencart version installed in your system. 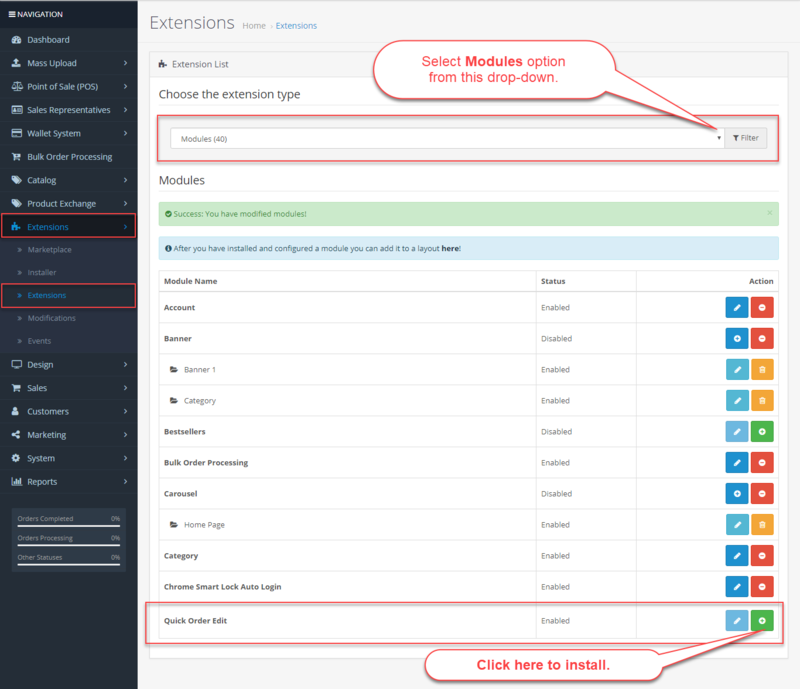 After uploading the Zip file, please navigate through Extensions > Modifications. Now, click the Refresh button as visible in below screenshot. 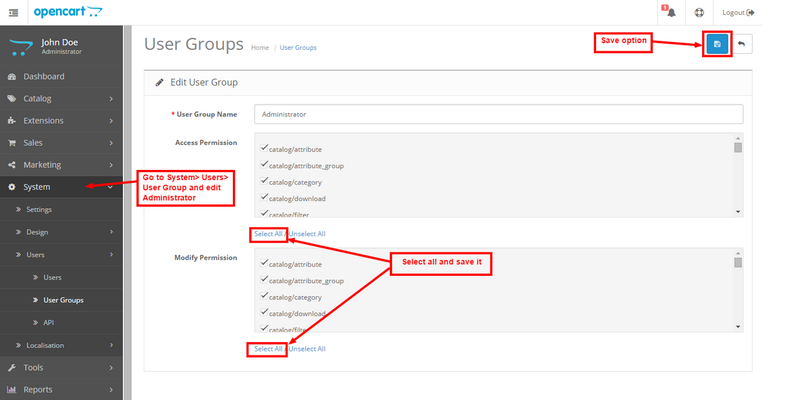 After that, in Admin panel go to System -> Users -> Usergroup and edit ‘Administrator’ and select all for both Access and Modify Permission then save it. After that under Extension > Modules install the module as shown below. 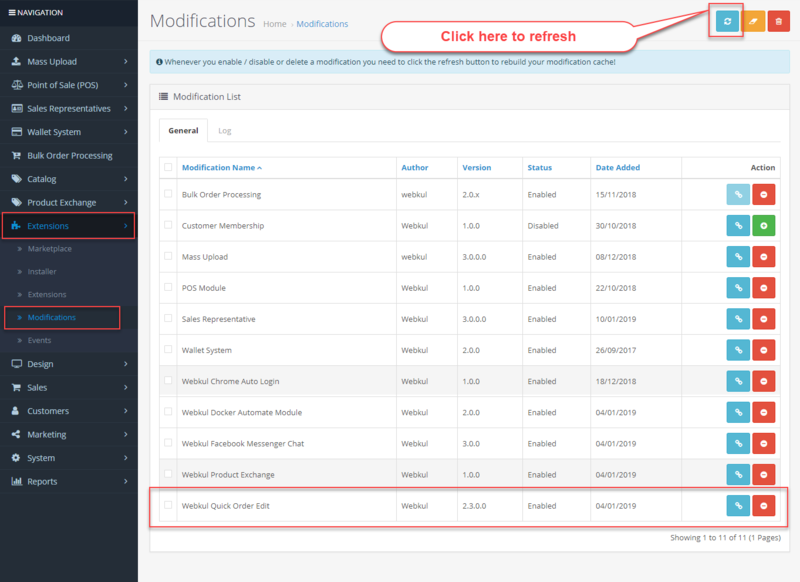 After the module installation, the admin can easily configure the module settings. For this, the admin will navigate to Extensions -> Modules as per the below image. Here, select the module and then click on the Edit icon. This will navigate the admin to the module configuration page as per the below image. Status: enable the module by selecting “Enable”. Else select “Disable” to disable the module. And, lastly will hit the Save Config button to save the module configuration successfully. After enabling the module, the admin can easily quick edit the orders. For this, the admin will navigate to Sales -> Orders as shown below. Here, the admin clicks the Click Order Edit option for the order which the admin wants to edit. This will navigate the admin to the Quick Order Edit page as shown below. The Quick Order Edit page displays all the sections of the order within the single page. This will allow the admin to edit any section of the order without following the step-wise procedure. After editing the order, each section can be saved individually instead of saving the complete whole order. The admin can also quick edit the order from the order view page. Clicking the View link will navigate the admin to the Order View page as shown below. Here, the admin will click the Quick Order Edit button. This will navigate the admin to the Quick Order Edit page as shown below.